A source of pride for the students, staff and community, Lafayette Elementary School, was scheduled by the Department of General Services for a full building modernization and addition. This existing neighborhood school was in need of restoration, rehabilitation and also required a significant addition to accommodate a larger school population, upwards of 800 students, as well as to provide modern classrooms and enhanced extracurricular spaces, which are imperative in the 21st century learning environment. 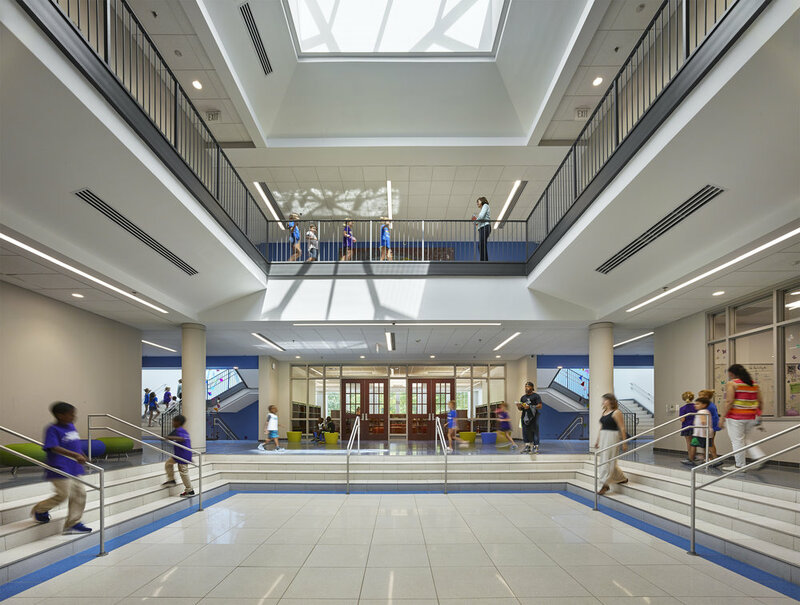 In July of 2014, DGS commissioned the design team to modernize the Lafayette school focusing on both the school’s mission and the community’s aspirations and goals for the complex and its site. The project was procured as a design/build fast-track project and was completed in August of 2016. The design team approached the renovation and addition of Lafayette Elementary School as a multi-faceted historic resources project. The scope of work not only included historic preservation of the building but also encompassed respect for and attention to the existing historic fabric - the site, the history of the school, and the general sensibility of the historic neighborhood. The design team divided the effort into four main categories: the identification and removal of noncontributing and non-compatible structures, technical historic preservation of existing building elements scheduled to remain, comprehensive research for the design and detailing of elements to be replaced, and attention to the defining elements and principles that characterize the original school and the surrounding neighborhood in order to ensure complementary and appropriate additions to the existing complex. All of the above work was done in close consultation with representatives of the Commission of Fine Arts, Historic Preservation Office and in conjunction with the architectural historian providing the National Register Nomination. Discussion with these historic review groups began during the program stage and continued through construction.